... but the police demand your worship. 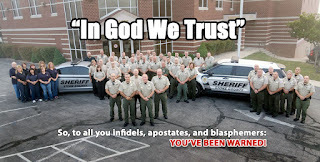 Sheriff Doug Rader of Missouri's Stone County complains that he is being“attacked” for a “patriotic gesture” – decorating his department's patrol vehicles with the motto “In God We Trust.” By focusing on a largely symbolic controversy, both the sheriff's defenders and detractors are ignoring a more tangible threat – the sheriff's insistence, typical of his profession, that citizens render immediate, unconditional obedience to law enforcement officers as duly appointed ministers of violence on behalf of the divine State. Rader is correct in pointing out that many other law enforcement agencies display the phrase – which is the official national motto – on their vehicles. As legal commentator and retired Judge Andrew Napolitano points out, this practice is in compliance with Supreme Court precedents, even though it does prompt objections from proponents of strict separation of church and state (including some believers offended by the profanation of faith through association with the monstrosity called the state). Jessica White, her husband Jordan, and her father-in-law Donny can testify that it isn't necessary to be “doing something wrong” to find oneself on the receiving end of state-consecrated violence inflicted by Stone County Sheriff's deputies. Each of them is completing a three-year term of probation on charges arising from a May 5, 2012 incident in which they were beaten and arrested by deputies who had invaded their property without a warrant or probable cause. A few minutes later, two more deputies – Taylor Jenkins and Brandon Flack – arrived on the scene with a police dog. Without a warrant, probable cause, or consent, Jenkins and Flack swaggered onto the property to interrogate the Whites. Understandably, things degenerated very rapidly. Given that this statement was issued by a law enforcement agency, it isn't surprising that it is severely at variance with the facts, which were captured on video by at least two witnesses. The SCSO statement conveys the impression that the Whites were trying to impede the arrest of the detained motorist, Thomas Barnett, who was the subject of a municipal warrant. The video documents that Jordan and Donny White became agitated by the uninvited and unwarranted intrusion of Deputies Jenkins and Flack and their weaponized canine. Seizing Donny, Deputy Jenkins snarled, “Get on the f**king ground!” and threw the man face-down on the cement carport surface. Jessica, who at the time was an elected alderwoman in Crane, had been trying to reason with the deputies, only to receive vulgar verbal abuse in return. After seeing her husband and father-in-law brutalized without provocation, the small, petite woman intervened directly, striking at Jenkins in a desperate attempt to defend Donny. Flack grabbed Jessica and thrust her to the ground, wounding her leg and inflicting severe, lasting damage to her shoulder in the process. Neighbors looked on in horror as the deputies – acting in violation of use-of-force guidelines – used a Taser to inflict several prolonged “drive-stuns” on Donny, who was prone and handcuffed. As Wiley pointed out, the injuries inflicted by the deputies were rather more severe than the hurt feelings they supposedly experienced. Committing aggressive violence is the priestly prerogative of the police officer. Protecting one's self or a loved one from such violence is an impermissible sacrilege. 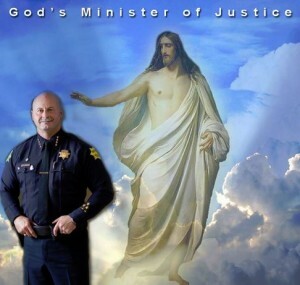 Because they had defied commands issued by their heaven-ordained supervisors – and, in Jessica's case, profaned the consecrated body of a divine emissary by coming to the aid of her father-in-law – the Whites were compelled to accept “Alford pleas” for charges including third-degree assault on an officer and resisting or interfering with an arrest. In September 2013 they were sentenced to two years ofunsupervised probation. 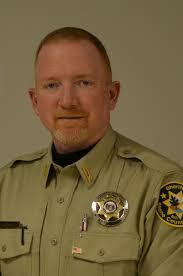 The incident involving the Whites occurred prior to Doug Rader's election as Stone County Sheriff. Neither Jenkins nor Flack is listed on the department's current personnel roster. One of Rader's first gestures in office was to issue a statement promising Stone County residents that he would protect them against a hypothetical gun-grab by the Obama administration. 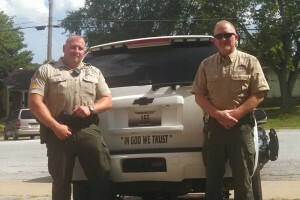 Like the decision to place the motto “In God We Trust” on patrol vehicles, that promise was a facile symbolic gesture. He has yet to provide substantive assurances to Stone County residents that he will protect them from the proven threat of criminal violence on the part of his subordinates. America long ago ceased to be ruled by a monarchy, and succumbed to a more invasive and violent strain of statism in which police officers are seen as “God’s agents on earth,” to borrow Max Weber’s unironic expression. Throughout the soyuz, police departments and prosecutors have been treating “contempt of cop” as a form of criminal blasphemy. One of Boyler’s recent posts described an illegal cell phone search conducted by an officer he identified as “Joseph `Pig Face’ Leo.” Leo filed a complaint against Boyler, who was arrested for “aggravated harassment.” That charge was quickly dismissed, as the officer most likely knew it would be. But it did lead to Boyler being incarcerated for several days as summary punishment for lese majeste. which was the objective. Boyler has filed a $1.25 million lawsuit. “If the courts criminalize this kind of speech, there goes the First Amendment,” predicts Buffalo attorney James Ostrowski, who is representing Boyler. “It’s pure political speech that led to his arrest…. This goes back to colonial days when people got arrested for criticizing the king” – a personage who was supposedly wreathed in sanctity. Meridian, Idaho resident Matt Townsend faces trial a spurious “witness intimidation” charge — and a potential five-year-prison term — for a Facebook post criticizing an officer who arrested him without cause. Roseville, California resident Dominic Ray Aguilar was charged with making a “terrorist threat” following a post suggesting that a police officer who had killed an unarmed man should likewise face a violent death. The late Bob Foster, a businessman from Sunriver, Oregon, was hit with a stalking protection order by police officers as retaliation for his peaceful activism (most of which involved speaking out at meetings of the local home owners association). Santaquin, Utah resident Shawn Peterson lost his job as a short-order cook following a social media campaign organized by police unions targeting his restaurant in retaliation for a Facebook post in which Peterson criticized the police. Only in a police state are people punished for criticizing the police. Your help in keeping Pro Libertate online would be very appreciated. Thank you! These jackals condemn themselves out of their own mouth. The persons responsible for the violation of unalienable rights will surely be judged by the creator from whom we receive all gifts! Intimidate and victimize is the opposite to serve and protect,ugly minds in uniform. It saddens me deeply to see that so many American Christians hold to a divine right of kings interpretation of Romans 13, an interpretation that when applied falls into a great deal of conflict with the rest of Scripture.